In an environmental context, the phrase means you need to think hard and seriously about the conditions of the planet at the same time you take action in your own community to help protect your local space that is part of the larger planet. 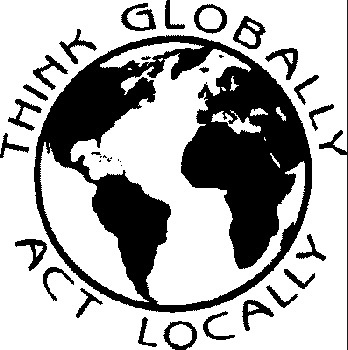 It is hoped that if everyone takes action at the local level, there will be a cumulative positive effect on the planet at large. Another way of describing the meaning of the phrase is that people should think about the global significance on the environment while they take action to improve their local environment. For instance, you can think about the problem with trash disposal across the world, but to avoid being stymied by the scope of the problem, you can reduce your own waste and recycle more which is a step in solving the world-wide problem. To the extent that more and more people take local actions, the positive effects spread wider and wider. Identify one action you can take locally in your community that will contribute to easing the impacts from climate change. Identify one action that can be taken only at the global level that will contribute to easing the impacts from climate change. What can you do to help advance the global solution to climate change? What can others do to help advance your local action to ease the impacts from climate change?